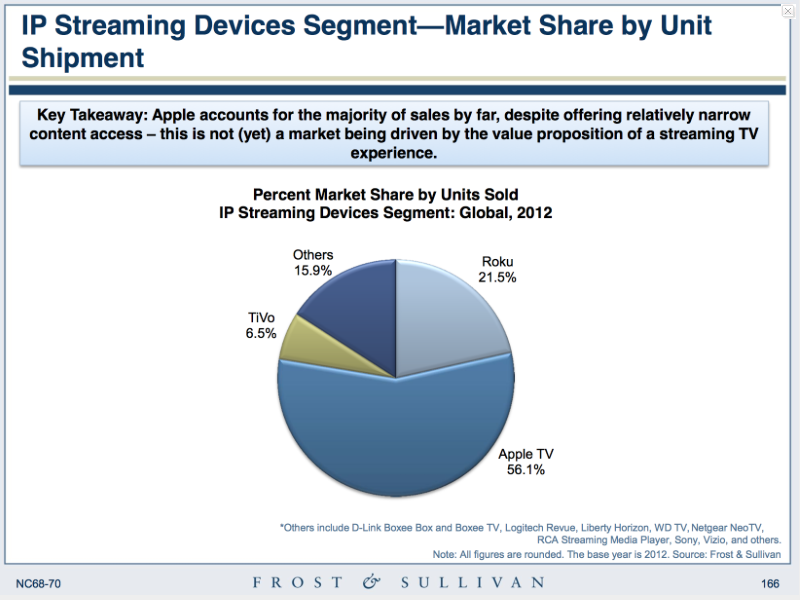 A market report by Frost & Sullivan called particular attention to Apple TV's AirPlay feature, which it notes was "strategically crafted to simplify the process of transferring laptop and tablet displays to a TV screen." AirPlay "is the primary reason for purchase of Apple TV devices"
The firm added, "it is AirPlaying  not OTT [Over The Air] streaming  that is the primary reason for purchase of Apple TV devices." After Roku, TiVo is "the next strongest installed base of users," the firm said, adding that "Google is conspicuous by its absence in this segment" of TV set top boxes. Google TV "conspicuous by its absence"
In late 2011, Google's executive chairman Eric Schmidt announced to a conference crowd that "by the summer of 2012, the majority of the televisions you see in stores will have Google TV embedded." As The Verge noted at the time, Schmidt's "claim would seem to run counter to mixed reviews, disappointing sales numbers to date, and the growth of competing connected TV platforms." Looking at 2012 in retrospect, Frost & Sullivan stated, "Devices based on the Google TV platform have seen very little commercial success so far, with our estimates of less than 1M total installed devices, of which the discontinued Logitech Revue accounts for the lions share."